I became the adjutant General in 2006 ,winning the legislative election to succeed Martha Rain ville,who retired to run for the united states House of Rep.I won election to a full term in 2007,and was reelected in 2009 and 2011 in Vermont ,the Adjutant General is elected for a two year term by a secret ballot f the Vermont General Assembly.In 2010 i became President of the adjutants General Associate of the united states.I have been lucky in life and now I am looking to be lucky in love. I am a fun loving guy who loves to have a good time, and fully believe that laughter truly is the best medicine.However, that said, I do know when and where to be serious and respect that trait in others as well. I enjoy a wide range of activities from your stereotypical walk on the beach to something more offbeat like painting in the park. Generally I consider myself to be very open to new experiences and will try almost anything once. Really though, I think fun comes from who you are with rather than what you are doing. Good company can make what would have been a mundane experience a great time. I look forward to seeing what the future will bring with the right person and am optimistic that I will find someone to spend my life with. However at this time I just want to take things slow and have some fun times with a fantastic woman . I found another FaceBook account using this man’s image under the name Augustine Esther. Just thought you would like to know. Please feel free to contact me. 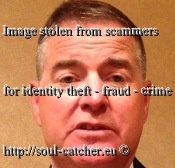 the scammer is now using Brian Dubie’s photo on skype the address is BRIAN.DUBIE” email is megazama999. just added me recently. I know it is the same scammer with David Miller name. I googled but so far no warnings about Brian Dubie scams but I came across this one I thought to let you know maybe you know how to contact the real person and let them know. My best friend us being scammed now. She’s already sent him money. He’s telling her he is in Bagdad now. He started talking to me today. I would love to help catch this monster. I can tell he doesn’t speak good English. He got my friend to send Mont to new haven Connecticut. Forgot to tell you the man is using the name John Ghram.